No!...the weather is changing...we're going backwards, not forwards! The past two weeks have been absolutely beautiful in the Bay Area and now the temps have dropped with showers and blustery winds forecasted for the next couple of days. So I guess it's time to break out the soup, once again. 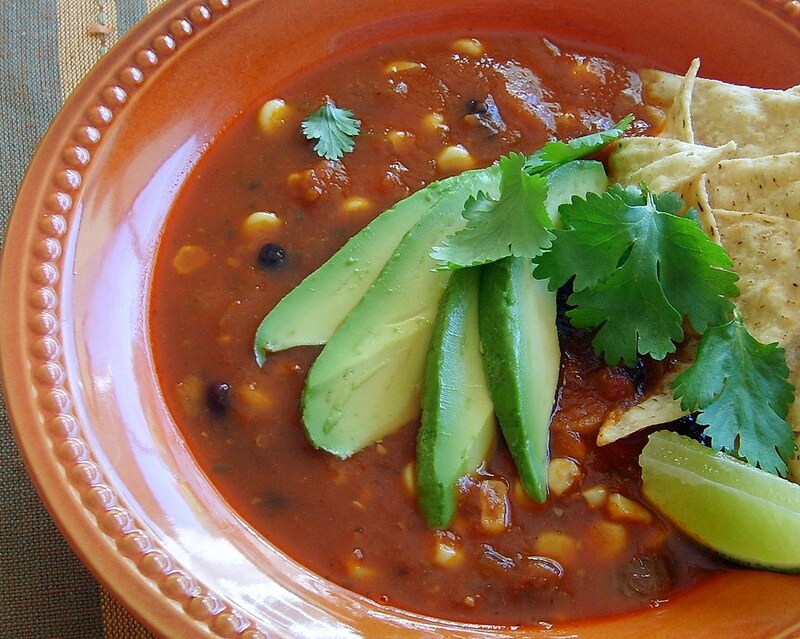 Regardless of the temp outside, I love tortilla soup! I prefer it over Chili any day because it is so much lighter and can be enjoyed during the summer months, especially when fresh corn and tomatoes are at their peak and you don't need to use frozen or canned! Note: Dried New Mexico chilies are very earthy in flavor and they impart a deep rich color to the soup. They are not spicy and can be purchased at major grocery stores, but I prefer to buy in bulk at my local Hispanic market. Remove the stem and seeds from the chilies and place in a small sauce pan. Add two cups vegetable stock/broth and bring to a boil. Remove pan from heat and cover and let steep for 30 minutes until soft. Then blend in a food processor or blender until smooth, strain and set sauce aside. Meanwhile, finely dice onion, red pepper and garlic and set aside. In a food processor or blender, puree tomatoes until smooth. Heat a large pot on medium heat and add canola oil, onions, and red peppers cook until soft. Add minced garlic and cook a few minutes longer. Add tomato puree, chili sauce, spices and the remaining four cups vegetable stock and bring to a boil. Reduce heat to medium-low and let simmer until the flavors develop and soup thickens, about 30-40 minutes. Add beans, corn, season with salt and pepper to taste and heat through. Serve with the following condiments...and Enjoy!